was indicated as John Nicholls at the Old Bailey on Wednesday 21 April 1784 for feloniously stealing a large quantity of goods from a hair merchant and perfumer in London, where he worked as a servant and porter’s assistant. Sentenced to seven years transportation he spent time on the Censor Hulk before embarkation on the Scarborough. Following his arrival in Port Jackson, John who was recorded as a Gardner, became a very successful landholder of various properties by grant and purchase up until the time of his death in 1822. As a farmer John owned livestock, and cultivated his land with wheat and maize. John’s first marriage in 1788 was to Mary Carroll, although they only had 6 months together. Following her death, he married Ann Pugh (Earl Cornwallis 1801) on the 25 August 1803; the Reverend John Marsden officiated. John and Ann Nicols had twelve children from 1802 until 1823. Ann was left to care for 11 of the children after John died in 1822. Deceased was buried with full Military honours the coffin draped with the Australian Flag being borne to the grave-side on a Gun-carriage preceded by a Firing Party from No.5 Group Pall. Chaplain the Rev J Rooke (Church of England) conducted the burial service, at the close of which the ‘Last Post’ was sounded and volleys fired over the grave. About 200 N.C.O.’s and men followed the remains and were present at the graveside ceremony. Headquarters A.I.F. Depots in United Kingdom were represented at the funeral. Awarded the Military Medal 14 January 1918 for conspicuous courage and devotion to duty. On 4/10/17 during the attack at Broodseinde he acted as a Stretcher Bearer and continued for hours to carry wounded to the rear quite regardless of heavy fire and personal risk. He then returned to the front line positions and acted as one of the garrison of a post. The following day he resumed Stretcher Bearing and his courage and coolness under fire and power of endurance proved to have a great influence on all he came into contact with. Introduced in 1917, the 1914 Star was the first generic service medal. It was awarded for service in France and Belgium from 5 August to 22 November 1914. Fewer than 250 Australians, mostly medical personnel, received it. Like the 1914-1915 Star it was never issued alone, always accompanying the British War Medal and Victory Medal. 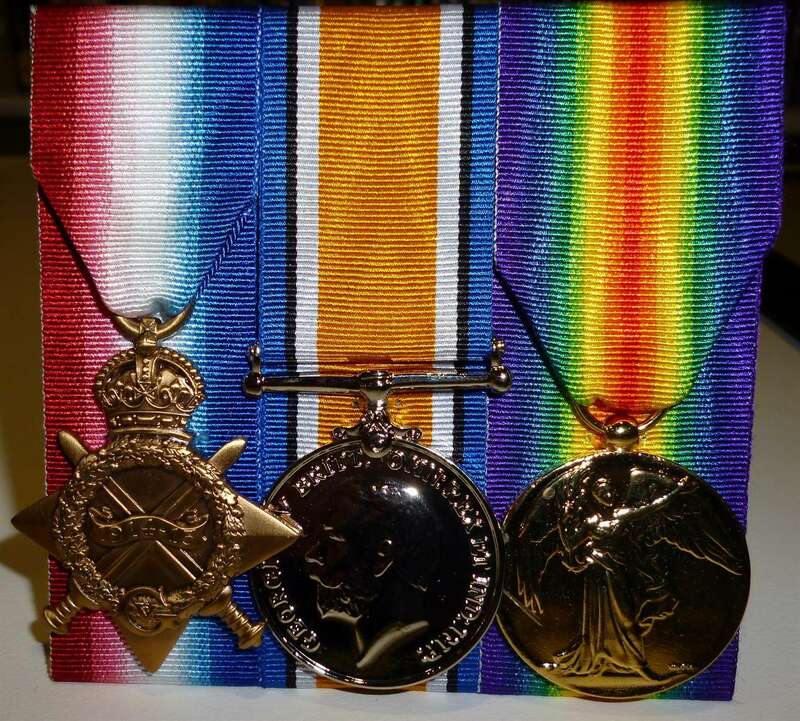 The 1914-15 Star was awarded for service in any theatre of war from August 1914 to 31 December 1915. The vast majority of its 82,000 Aussie recipients received it for services in the Middle East and Gallipoli. Initiated in 1919 along with the Victory Medal, this medal depicts St George on horseback trampling the eagle shield of the Central Powers. It recognised those who were ready for active service from 5 August 1914 to 11 November 1918, whether they saw the battlefield or not, it was later extended to 1920 to include those who participated in naval mine-sweeping or intervened in the Russian Civil War. In total 6.5 million were issued, with about 400,000 going to Australia. In gilded bronze, this was often referred to as the Allied War Medal. Thirteen Allied countries used the design, and the rainbow ribbon represented them united in a single cause. It was awarded to men and women who entered a theatre of war from 5 August 1914 to 11 November 1919. About 5.7 million were issued with 400,000 going to Australians.